When the first footage for Christopher Nolan's The Dark Knight Rises was leaked, there was much complaining about his voice (no matter how naive those complaints might have been). A similar thing happened when images of DKR merchandise began trickling onto the internet. Initially, we saw statues and small kid-related figures, and it was some time before we got a look at any of the Movie Masters line (aka the only Batman figures anyone really cares about). Even then, Bane was conspicuously absent. Cue the bitching and moaning! 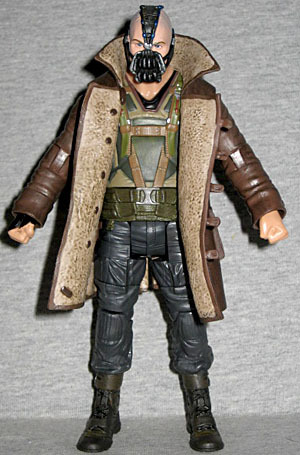 Well, now the Movie Masters line has been released, and of course there is a Bane. There's also a Batman (double of course), and a Michael Caine version of Alfred Pennyworth in the first series, with more on the way. Collecting all six will allow you to build your own batsignal, so here's hoping DKR doesn't pull a Green Lantern and we actually get to see the next series of figures to complete the signal. 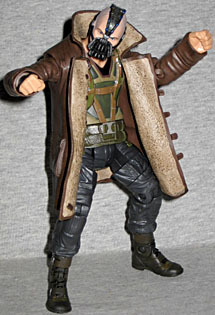 So, my attempt at boycotting all Mattel product ends with Bane. His sculpt is quite nice. He's big; though he's just a shade taller than Batman, that's only if you take Bats's ears into account. Who says Mattel can't release a villain that's taller than its heroes? Bane looks quite a bit different than his comic counterpart: he's traded his luchador mask for some kind of facial harness with a grill resembling mechanical teeth. Apparently this will be the system that administers Bane's signature Venom serum, or whatever the film's equivalent of said system might be. His tank top is gone; instead, we get a high-collared, fur-lined coat. Under the coat he's got a padded vest covered with straps and buckles, and cargo pants and boots complete the look. 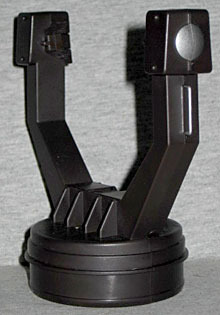 The sculpt is very good, and all the surfaces have unique details and accurate texture, with the possible exception of the torso, which seems rather flat and undetailed. While it looks like a close approximation of Bane's vest in the production photos, the detail is a bit soft, though it only stands out so much because the rest of the figure's sculpt is so well done. The paint is also very nice. The head is probably the best part: the eyes are cleanly done, the skin features a few different tones, but where it really shines is the mask/harness. There are very subtle variations of color that only show up on close inspection. Deep browns, black, and even some blue are used on the mask, along with some silver dry brushing to bring out the facial grill. It all works really well. The coat is also very nicely painted, with subtle washes that bring out the texture nicely, especially on the fur trim. The torso features a lot of different colors, including red, light brown, ochre, silver, and two shades of green, but it doesn't quite feature the same level of subtlety as the head. The gray pants and dark brown boots are okay, but when compared to the rest of the paint, they almost seem like afterthoughts. 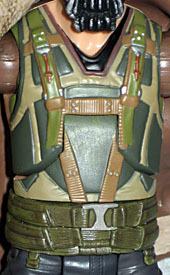 Interestingly, his torso seems to be molded in a fleshtone and then painted with all the different colors of his vest. You can see this on his neck, and also the back of the torso sculpt, which is curiously left unpainted. There are no sculptural details on the back of the torso, either. It isn't something you can see without lifting up the coat (and why would you?) but it's interesting to note. Bane's got a lot of movement, with a few glaring absences. He's got a balljointed neck, pegged and hinged shoulders, hinged elbows, hinged torso, peg wrists, pegged and hinged hips, peg thighs, hinged knees, and hinged ankles. He doesn't get double hinged elbows or knees, but he doesn't really need them. What he is sorely missing are joints in the biceps, which would give his arms some much needed flexibility, especially since the shoulders get restricted due to the extra coat piece. They'd be easy to hide, too. And though he definitely has a waist, mine wouldn't turn. Nevertheless, he's still quite poseable. Bane's hands are balled into tight fists, so he doesn't come with anything to hold onto. All he gets is a piece of the Build-A-Signal: the cradle that the signal light itself sits in, to be specific. Though it's not much on its own, one assumes that the end result of collecting and connecting all the pieces will be well worth it. Here's hoping! Bane is a very well done figure. Mattel has never really had any trouble making good figures (it's everything else they seem to have trouble with), but this one is really top-notch. Whether you like the design or not, the figure is a great rendition of Christopher Nolan's version of Bane. The only thing that's really missing are some bicep joints. Or maybe a sound chip, to remind everyone who worried about his voice how much time they wasted.